Bathrooms are the smallest functional rooms in your home. It must be designed with proper care, taking a look at the fixtures, storage option and other decorations. For a properly designed bathroom, always try to consider the users of the area, and different design elements, including lighting, fixtures, plumbing, and accessories. 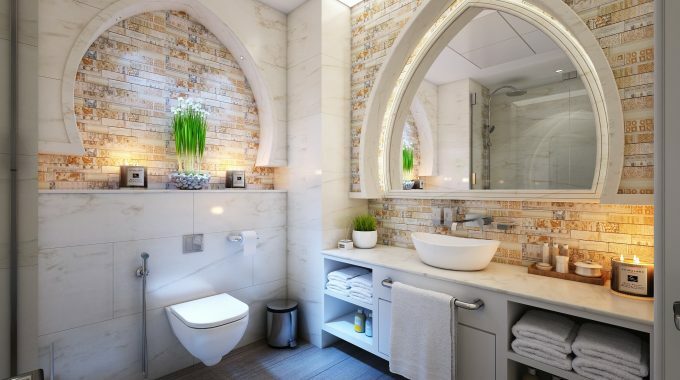 When designing a new bathroom interior, the things that you should take into consideration are mainly, color, shape, surfaces, and the materials. First of all, create a unique layout and start the process of installation, make sure there is a comfortable flow within the room. Try to come up with a wonderful floor plan, and exclusive bathroom design ideas to have a great bathroom area. It is really important to create an attractive and inviting bathroom interior. 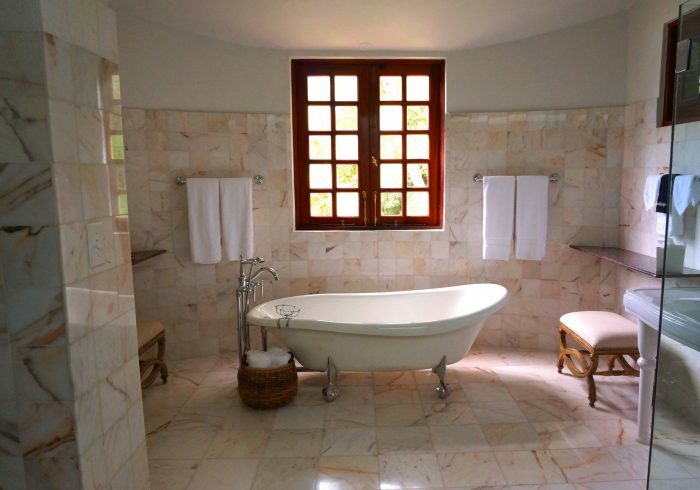 Now let us have a look at some of the amazingly easy tips to create an ideal bathroom interior. The building, remodeling, or designing of a perfect bathroom has always been an exciting, challenging, and thoughtful process in an interior designing project. 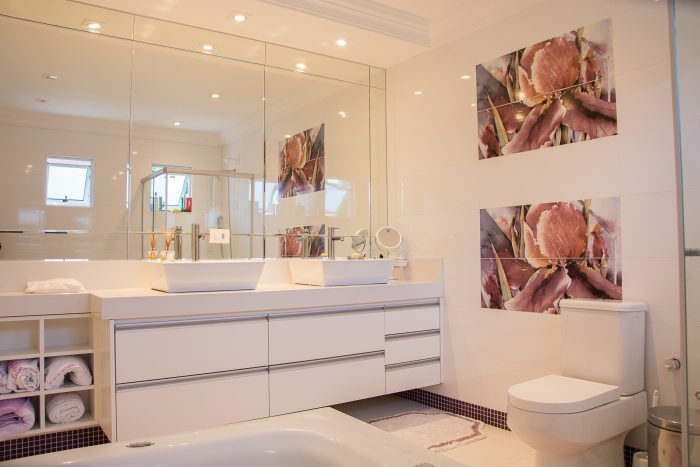 To create your dream bathroom area, assess your needs and come up with an efficient layout within a specific budget. No matter what type of bathroom you are remodeling, an attractive and functional floor plan is the key to have a successful space. A functional floor plan is really helpful in building and remodeling a bathroom successfully. Bathroom floor plans fall into a variety of layouts that lines up the sink, toilet, in a unique pattern. While designing a particular bathroom interior, try and consider different users in order to create a beneficial and attractive room. The key to elegant decorating is having an overall plan or a well-designed layout. As the bathrooms involve several infrastructures, it is wise to draw a basic layout of the room before beginning the designing process. With a smart strategy, it is a lot easier to hire contractors and shop for beautiful bathroom fixtures. Working with a certified bathroom designer or architect will help you to dodge away from the mistakes while designing, and they will also provide sufficient tips to use your space wisely. As the bathroom possess different elements, it is essential to know how to arrange a bathroom in an interesting way. Answer some important questions regarding your afterward usage of the area and determine the space-planning requirements. To create a new bathing area, think about how this space would function. You are also free to seek the advice of an experienced professional interior designer if you are expecting a classy bathroom interior. A designer need to know who is using the bathroom, and how they will use the space. With this information, the designer may provide you with some exclusive layout ideas that you might have overlooked. Even the most common bathroom has to deal with various significant works including, plumbing works, water lines, and others. A splash of color can completely transform your bathroom interior into something new. Color schemes are essential for getting the look and feel with the design you want in your bathroom. You are free to add any pops of color to the room, like mild, or bold and bright wall colors. Adding a bright color to your bathroom walls will uplift the entire home. If you are looking forward to a get a modern look in your interiors, it will be good to choose light colors that would complement the color scheme of your bathroom. 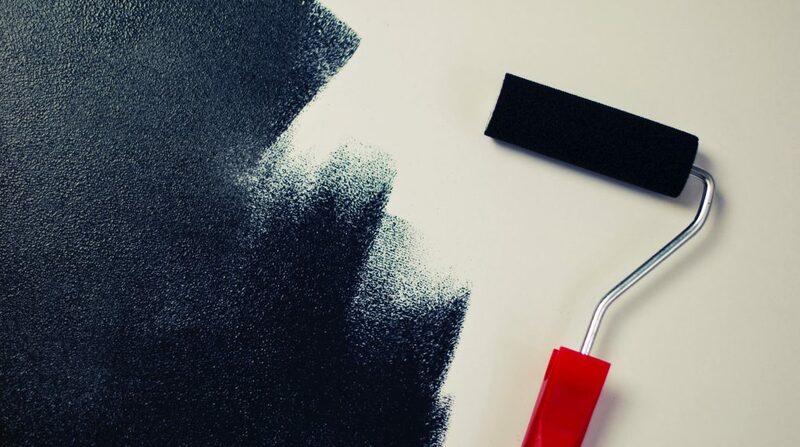 Painting the bathroom walls is one of the simplest and affordable ways to add some color to your space. Always try to select the shade that you like the most, and decide on the rest of the room’s color scheme according to it. There was a time when people tend to opt for the light and patterned tile range, but today, the modern bathrooms use colorful tiles that draw everybody’s attention. The wood, stone or tile added in the floors and walls play a major role in creating an overall color personality in your bathroom interior. Colour scheme is an important aspect of bathroom interior design. The homeowners are totally free to use them as they like in their space. If you are looking for a space that provides ample light and air, using light color schemes can help to create a lot of space. Color has the power to energize and to calm you down. Try to consider the mood you want to evoke inside the bathroom before selecting the materials. The sink and tub that you select can also contribute to the bathroom color scheme. You can come up with a color scheme that portrays your personality by opting a bold color range with colorful tiles or paint throughout the room. You could even add the color tone on the ceiling for maximum impact, or you can choose a neutral color. Try to match the tone of the paint or tile that you decided to use inside the bathroom interior with other fixtures and elements you add. Choosing white or neutral color tones are still in the trend, it will give a sophisticated feeling inside the bathroom. Your bathroom is a collection of design features and functional appliances that can create an attractive space. For having a wonderful bathroom interior, you have to include various bathroom fixtures and hardware that is in trend, and that works properly. 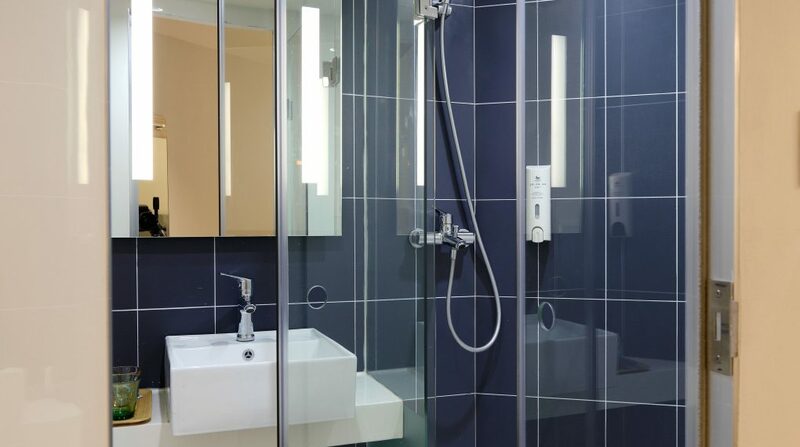 Your bathroom is a wet environment, that includes various important additions like bathtub or shower. So the fixtures and structures you choose for your bathroom should cope up with the moisture in the interiors. Unfortunately, many homeowners seeking bathroom renovations that are cheap or select faucets that will rust over time. For having a great bathroom space try to choose an interior designer, architect or a contractor who is experienced and skilled who will pay attention even to the small details. Try to have high-quality, plumbing fixtures, cabinetry, and flooring that are properly installed. These are the vital parts of a bathroom that will be both beautiful and long-lasting. 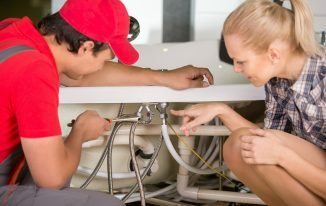 The major features of a bathroom are organized looking at the room size and the plumbing connections. We can easily find a wide range of design choices in the market. Begin with functionality, so think on who will be using the bathroom, the space you have and about the products that will serve your goals. If are up to creating an open wet-room style set-up, consider the mood of your bathroom. It is important to choose fixtures for your bathroom that have a matching finish. Have a trusted partner or a designer in choosing high-quality fixtures that look amazing and will last more in your bathroom. Today, we use taps to get a direct flow of water, these are available in different sizes and styles. When it comes to adding proper lighting, one of the most critical rooms in the home is the bathroom. But, when it comes to interior lighting, bathroom areas are probably given the least consideration among all the other rooms. 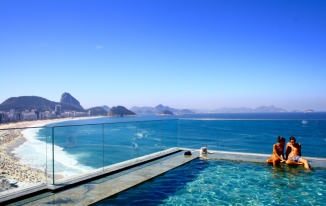 It is one of the first places where people go when they wake up in the morning, to wash and groom. We can see a lot of bathrooms with inadequate lighting and mirror. Often people tend to add a single ceiling fixture piece that can provide enough light in the entire room, it is not a good habit. As the bathroom is developing with various modern fixtures, lighting has to be given an extra thought. An ample lighting plan can enhance the overall mood of the room. We must come up with each and every opportunity for the best bathroom illumination. The most difficult area to install bathroom lighting is the mirror. You must remember to place lights on each side of the mirror, as the arrangement will help in illuminating your face, eliminating shadows. For a general bathroom lighting, you can use ceiling lights, chandeliers or pendant lights. It can be noticed that most of the bathroom interiors are equipped with a simple lighting installation. You can enhance the room even with a mild lighting, with a unique interior design solution. Add some exclusive lighting that can provide a great ambiance to a bathroom, with some decoration, softness, and texture. Add a matching wall color that can embellish the lighting and make the room feel inviting and attractive. Natural daylight is ideal for any bathroom interior, you can include one or two windows in the opposite walls to balance the illumination. As the bathroom is used in the night time, it is important to provide some light as a safety measure. You are also free to add some decorative lighting, as it will instill some interest in the space. Choose bathroom light fixtures according to your likes, it can be both soft or bright, which can reflect your favorite spot. 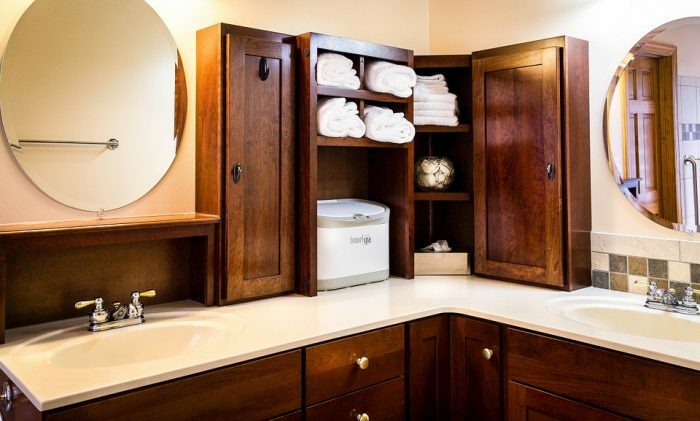 There are so much you need to store in the bathroom, but there is rarely any space to place everything. The storage area is one of the major concern in many bathrooms, but it has become a complementary part of interior design for bathrooms. When designing the layout, always keep in mind the importance of storage. A cluttered surface is a really bad thing to see in the bathroom interior. Install some stylish shelving and cabinets to create some great storage space in your bathroom. With this, you can avoid all the clutter and can store each and every item in an order. You can place soaps, shampoo, and other such elements in these storage spaces. It is also possible to display various decor, accessories and bathroom-friendly greenery in your bathroom interior. A great bathroom shelving with a beautiful design is both timeless and useful for the people who use it often, and also for the guests. These spaces work brilliantly in bathroom areas and can be used all over the home too. You can either build a custom wall shelf or cabinet for your bathroom or can find a good one with right shape and size in a nearby store. You can put the towels and other items on the racks or maybe in a small closet on the walls. Adding some open shelves is an excellent idea for storing things like towels and bathroom necessities. It is also good to add some vertical shelves in your bathroom and use it to store shampoo bottles, toilet paper and all sorts of other things. Take stock of your available floor space to decide which option will work best to improve storage that can provide a sense of balance and a streamlined appeal. Modern bathroom storage cabinets and shelves are made in a stylish and functional way using trendy color schemes. Try to choose the storage solutions wisely, as the bathroom storage cabinets and shelves are your necessities. These storage cabinets and shelves are convenient and practical storage solutions, that offers a space to keep all your things where you need them. How to Clean Sofa Upholstery at home? Suffering from Water Problem? Give a Call to 24 Hour Plumber! What are the tax exemptions on loan against property in India?